Ferdinand III of the Kingdom of Castile and Leon was born in 1199 and died in 1252. He became king of Castile in 1217 and of Leon in 1230. His grandfather Alfonso VIII began the most successful campaign to restore his Catholic kingdom against Muslim occupation and Fernando consolidated the Reconquista in his own time. In 1231, he permanently united Castile and León as one kingdom later to become the unified country of Spain. Saint Fernando is the greatest of the kings of Castile in terms of what Catholic Spain owes to him in the Reconquest. It would be over 200 years after his death that King Ferdinand and Queen Isabella of Castile would finish the Reconquest and support Christopher Columbus in his colonizing and missionary efforts in the Americas. He was canonized in 1671. In Spanish, his name is Fernando el Santo, San Fernando or San Fernando Rey. 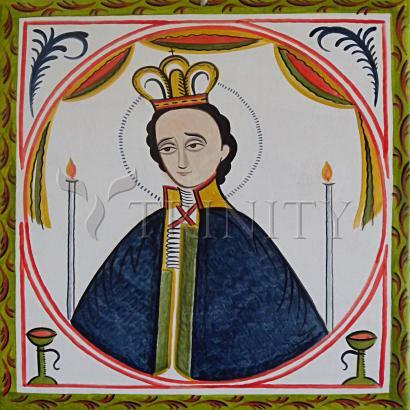 He is the patron saint of the city of San Fernando, the San Fernando Cathedral in San Antonio, Texas and the mission San Fernando Rey in the Los Angeles area of California. His feast day is May 30. King Saint Fernando III was born in the monastery of Valparaiso in Spain in the year 1199; exactly 100 years to the month after the death of his illustrious ancestor, Rodrigo Diaz, who was known by the honorary title of El Cid. He was a true son of the Cid, of noble heart and bearing. In him would be combined the soul of a knight dedicated entirely to God, the irresistible power of the Cid and, due to his royal heritage, the authority to marshal the might of an entire nation against the enemies of Christ. Saint Fernando's father was King Alfonso IX of Leon, and his mother the saintly Lady Bereguera. As his parent's marriage was annulled by Pope Innocent III, St. Fernando was actually raised by his grandfather, King Alfonso VIII of Castile, and his mother. King Alfonso VIII was a great warrior and knight, to whom Christian chivalry was more than just a code of conduct or a set of rules to which he adhered; it was a pursuit of virtue meant to guide him in all of his thoughts and actions. In striving for the ideal of knighthood, he attained a true nobility of character. Living a life of honor, King Alfonso was a magnificent warrior who courageously defended the Church and his kingdom of Castile. He was also an excellent role model for young Fernando, who wanted nothing more than to be a knight of Christ. St. Fernando was still a young man when he became king of Castile. His kingdom was in tatters, as there had been numerous raids by both Christian and Moor into Castile, as well as internal rebellions. Saint Fernando worked tirelessly to restore his realm to prosperity and administer justice throughout his land, though he continued always to train as a warrior. "Christ, my Lord, I am in Thy hands, the same way this sword is in mine. Show me, my King, what Thou wantest of this Thy knight." "I want to make your whole life like a representation and marvelous parable so that the coming centuries may contemplate the war that I, Eternal King and Universal Lord, wage against the powers of darkness, to conquer the entire earth for my Father. Fernando, you will be the noble and considerate king who leads his vassals in this great enterprise, the courageous and mortified King who, above all others, charges ahead in the midst of danger and endures the strain of hard work and the fatigue of battle. You will be the generous and magnanimous King who in victory does not worry about his treasures, but distributes the spoils among his faithful knights." God granted to Saint Fernando to see the stark outline of the life that was to be his, a life full of struggles and hardships and warfare. Yet his soul did not quake at the prospect, for he knew that he would be doing God's will, and that God would be with him as long as he remained true. He was prepared to do whatever was required of him now, and all the days of his life. King Saint Fernando became one of history's most gifted and formidable warriors, while being at the same time one of the greatest monarchs who ever ruled. He, like so many men of his time, did not seek to enjoy a long life so much as he sought to live a good life. Thus, he spent his entire life in the service of God, rather than wasting his time in service to himself. King St. Fernando was a man of clear and deep faith, who realized that everything depends on God and that it is He Who grants the victory. He knew, nonetheless, that the Lord never wants to help those who are lazy but to assist with grace those who do everything that is in their power. This effort becomes a prayer of action, when combined with trust in Him. As a consequence of his holy intentions, all of Saint Fernando's ventures met with success. He was absolutely invincible, personally as well as while directing his armies, conquering hearts and minds as completely as he did cities and strongholds. He knew that there is no holier enterprise than to do one's duty before God, and that his first obligation was to rescue his own country.